The Then & Wow! family festival at Glen Echo Park takes place Sunday from 11 a.m.-4 p.m. This annual event revisits the history of Glen Echo when it was an amusement park and celebrates its revitalization as an arts center. The event features kiddie rides, arcade games, videos and an exhibition on the Park’s history. 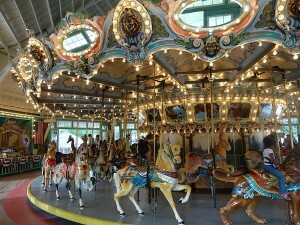 The festival also celebrates the last day of the Dentzel Carousel’s 97th season in Glen Echo Park. RIO Summer Concerts The series concludes with Diamond Alley (classic rock, Motown and pop) on Friday 6-9 p.m. and Guys in Thin Ties (’80s music) on Saturday 6-9 p.m. Rio Washingtonian Center, 209 Boardwalk Pl., Gaithersburg. 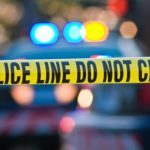 riowashingtonian.com. Free. “Almost Maine” In a mythical New England town, love is in the winter air, coming and going in strange, unexpected, and hilarious ways as people fall in and out of love. Written by John Cariani and directed by Kathryn Hegwood. Closes Sunday. F. Scott Fitzgerald Theatre, 503 Edmonston Dr., Rockville. fscottfitzgerald.showare.com. Tickets $20-$22. “The Canterville Ghost” An American family sets up residence in a haunted mansion in rural England in Marisha Chamberlain’s adaptation of Oscar Wilde’s novella, recommenced for age 7 and older. Closes Sunday at 2 p.m. Arts Barn, 311 Kent Square Rd., Gaithersburg. gaithersburgmd.gov. $12-$20. “Love and Information” Forum Theatre presents Caryl Churchill’s play composed of more than 60 mini-plays, with more than 100 characters trying to make sense of what they know. Opens Thursday at 8 p.m. Through Oct. 21. Forum Theatre, 8641 Colesville Rd., Silver Spring. forum-theatre.org. $18-$38. “Dexter Wansel Presents Sounds of Philadelphia” Singers Marilyn Ashford-Brown and Damon Williams join composer and musician Wansel in performing his songs from the ’70s and ’80s, as well as hits by other musicians he collaborated with, including Teddy Pendergrass and Patti LaBelle. 8 p.m. Bethesda Blues & Jazz Supper Club, 7719 Wisconsin Ave., Bethesda. bethesdabluesjazz.com. $35. Weed Warrior Volunteers remove invasive plants from Sligo Creek Park on National Public Lands Day. Students may earn SSL hours. 9-11 a.m. Sligo Creek Park. From Forest Glen Road, N.W. to University Boulevard, Silver Spring. montgomeryparks.org. Sign-up required. Colesville United Flea Market This event features a fish fry, flea market and an opportunity to donate household items you no longer need. 9 a.m.-2 p.m. Colesville United Methodist Church, 52 Randolph Road, Silver Spring. cumc.org. Free. Grace United Fall Festival and Flea Market The event features music, food, games, local vendors, a flea market, a moon bounce, crafts and more. 10 a.m.-3 p.m. Grace United Methodist Church, 119 N. Frederic Ave., Gaithersburg. 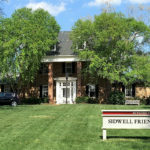 graceumc.org. Free. Washington Grove Fall Festival The arts-and-crafts festival features jewelry, paintings, prints, photographs, pottery, glass, wood, metal, leather and more by 25 regional artisans, plus food trucks, ice cream, a musical petting zoo, a pumpkin patch, pumpkin painting and a children’s art show. 10 a.m.-5 p.m. Washington Grove United Methodist Church, 303 Chestnut Rd., Washington Grove. washgroveumc.org. Free. Meditation class A class for beginners who want an introduction to meditation. 11 a.m.-noon. Meditation Museum, 9525 Georgia Ave., Silver Spring. eventbrite.com. Free. “How I Became a Pirate” Jeremy Jacob is a young boy who meets a group of pirates while playing on the beach. Based on the book by Melinda Long and directed by Jenny Male. Through Oct. 22 at Adventure Theatre in Glen Echo Park, 7300 MacArthur Blvd. Glen Echo. adventuretheatre-mtc.org. Tickets $19.50. 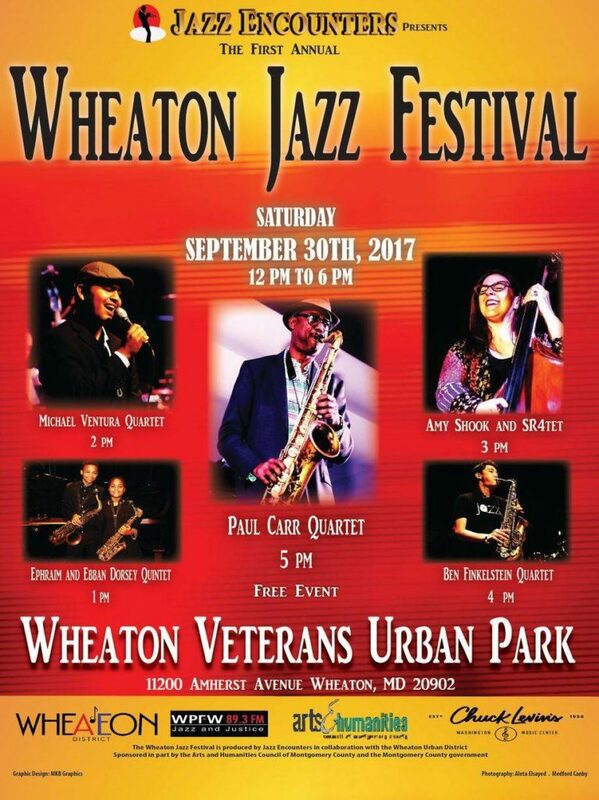 Wheaton Jazz Festival jazzencounters.comThe inaugural festival with headliner Paul Carr Quartet features The Ephraim and Ebban Dorsey Quintet, The Michael Ventura Quartet, Ben Finkelstein Quartet, and Amy Shook and SR4Tet. noon-6 p.m. Wheaton Veterans Urban Park, 11200 Amherst Ave., Wheaton. Free. “The Poetry of Love” Kalanidhi Dance presents five choreographed works inspired by love poems that span tradition, time and culture, featuring original music by Raman Kalyan. 6-7:30 p.m. Cultural Arts Center, Montgomery College, 7995 Georgia Ave., Silver Spring. kalanidhi.org. $25-$50. “In the Heights” Lin-Manuel Miranda’s 2008 Tony-winning musical is co-produced by the Olney Theatre Center and Round House Theatre, directed and choreographed by Marcos Santana and with original Broadway cast member Robin De Jesús as Usnavi. Extended through Oct. 22 at the Olney Theatre Center, 2001 Olney-Sandy Spring Rd., Olney. olneytheatre.org. Tickets $37-$84. “Almost Maine” In a mythical New England town, love is in the winter air, coming and going in strange, unexpected, and hilarious ways as people fall in and out of love. Written by John Cariani and directed by Kathryn Hegwood. Closes Sunday. F. Scott Fitzgerald Theatre, 503 Edmonston Dr., Rockville. fscottfitzgerald.showare.com. $20-$22. Summerhill Polo Exhibition Match Bring a picnic basket and enjoy a polo match with live music. 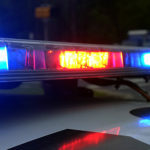 Summerhill Polo, Elgin and Jerusalem Rd., Poolesville. summerhillpolo.com. $15 per car. Nando’s Spicy Saturday Night Concerts The series concludes with Topik Sol (Reggae). 6:30-8:30 p.m. Fountain Plaza Stage, Veterans Plaza, Silver Spring. downtownsilverspring.com. Free. Young Dubliners with Andy Stack The Celtic rock band performs. 8 p.m. Amp by Strathmore, 11810 Grand Park Ave., North Bethesda. ampbystrathmore.com. $25-$35. Then & Wow! This family festival revisits Glen Echo’s history as an amusement park with kiddie rides, arcade games, videos and more. 11 a.m.-4 p.m. Glen Echo Park, 7300 MacArthur Blvd., Glen Echo. glenechopark.org. Free admission to the park. 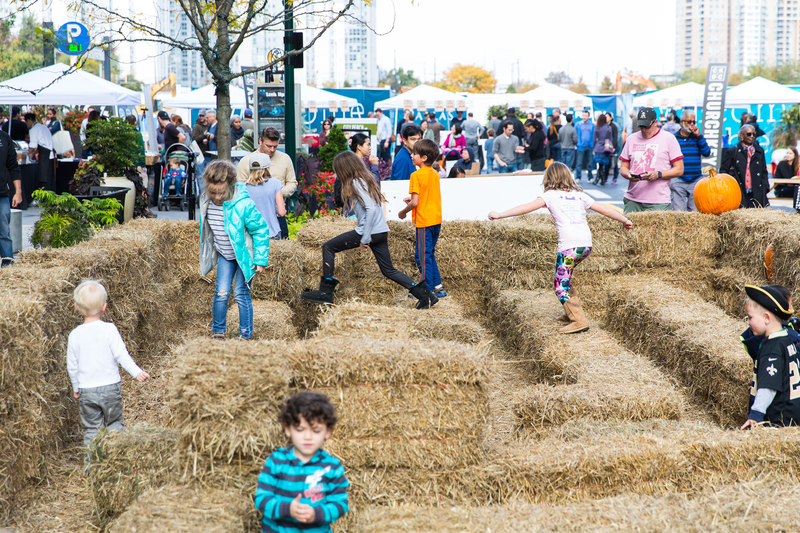 PIKEtoberfest Pike & Rose hosts a fall festival with live music from AMP by Strathmore, craft beer, hay maze, truck touch, rock climbing wall, lawn games and food. Pike & Rose, 11580 Old Georgetown Rd., North Bethesda. pikeandrose.com. Free. Harvest Moon Festival This annual festival features music and dance from around the globe, including The Didgeridoo with Chris Colvin & Friends (Australian Aboriginal), Akhmedova Ballet (Russian Folk Dance), Yatra Indian Dance Educators Association (classical Indian dance), Titanes Salseros (Latin dance) drum jam with Katy Gaughan, The Cheik Hamala Diabate Band (West African), and The Rose Moraes Band (Brazilian). Montgomery Community Media’s Tony Spearman-Leach is the Master of Ceremonies. 1-7 p.m. Veterans Plaza, Fenton St. and Ellsworth Dr., harvestmoonfestival. Silver Spring. Free. Perfect Pairings Wine Tour Spend a fall afternoon sampling more than 20 wines from around the world, paired with tapas style dishes at nine of the region’s restaurants. 1-5 p.m. Bethesda Row, 4950 Elm St., Bethesda. perfectpairings2017. $50.